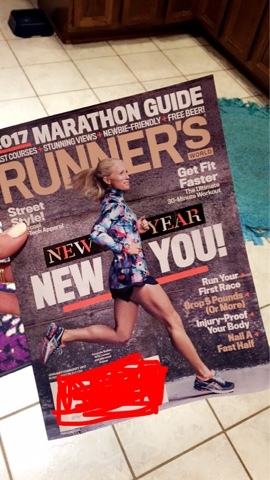 January/February Issued of Runner's World Magazine. January 21st, 2017. It happened. I looked at it about 15 times. It really happened. That's my mug. That's me. Woah. Rewind to about an hour before I found this picture in the magazine.....this was my Facebook status. My day that started out as being pretty fabulous turned to crap, real quick like. I didn't see it coming. Crappy weather. Crappy day at work. Just overall crappy day. I got home from work and decided that I would NOT look at Facebook or too much social media for that matter for the rest of the day. I have a love/hate relationship with it anyways and today I'm in NO MOOD for the nonsense. Sorry if it sounds harsh but it's the truth. I value friendships and relationships and find myself reading waaaaaaaayyyy too much into things that I see online. Therefore, out of sight, out of mind. Today was just a day that I wanted to be left alone. Works for me. Sorry Social Media. I'm out. Fast forward a few minutes later into my bubble bath. I read every article of this month's Runner's World Magazine. Once a month, I make time to sit down and read this magazine. I make no apologies, Runner's World Magazine and all of the people that are associated with the magazine are just the best. I've had the pleasure of meeting with several of the editors and becoming friends with Mr. Runner's World, Bart Yasso, himself and they are all really class act. I've been a subscriber for more than 10 years and have DREAMED of seeing my self in the magazine. Heck, I've even applied to be on the cover. I thought I might spot myself when I ran the Runner's World Half Marathon two years ago. Nope. Didn't happen. And then I thought I might spot myself in the magazine when the magazine posted an article on my local running group in Birmingham, Al. a few months ago. I'm pretty active in the Birmingham running community. Again. Nope. Didn't happen. Oh well. Haha. Don't take me that seriously. My life was certainly not made just from one picture in a magazine. I'm not that petty or vain. However, it's a cool magazine and I thought it was just a cool thing. 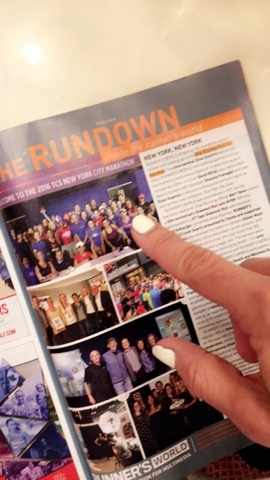 And I thought it was cool that it was a picture about TCS New York City Marathon. This was the version of the pic that I had on my phone! Lol. The first night that I landed in NYC to run the TCS New York City Marathon, Runner's World was hosting a 50th Anniversary Shakeout run through Central Park. Confession: This was my first time to run through Central Park. Remember that I'm from Alabama....I've never ran a race in NYC before. I was just a little bit excited to run through Central Park....and with the Runner's World Crew?! Heck yeah. So I got to the TCS New York City Marathon Village a few minutes early to take some pics, see where I needed to go etc. It was a GORGEOUS night in New York City. The sunset was beyond amazing. It was one of those nights that I just wanted to run and enjoy running. No watch. No directions. No distractions. Just a beautiful run through Central Park. 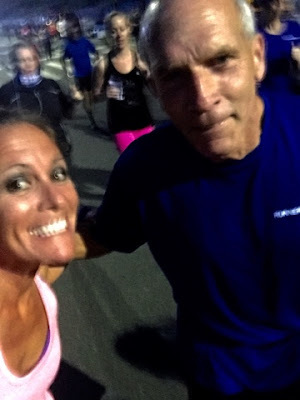 I didn't know a soul that was running besides myself and the folks from Runner's World Magazine. They gathered us all up and I stood in the back. I wanted to run by myself. I wanted to take it all in. 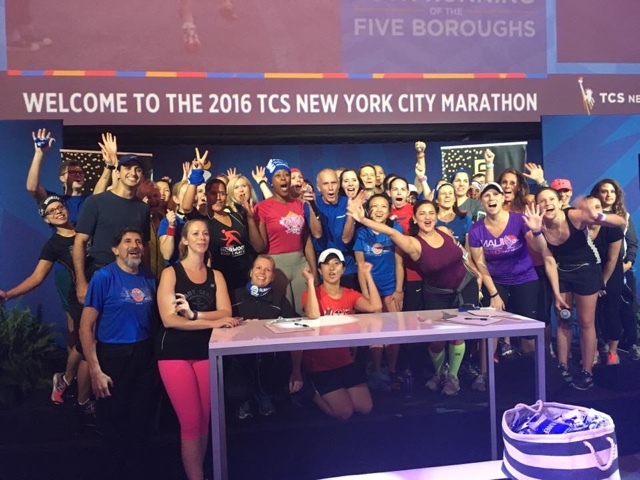 I wanted to take the whole weekend in....that was my ONLY plan for TCS New York City Marathon. Take it all in. Post run photo with Bart Yasso. I couldn't have asked for a better first night in NYC. 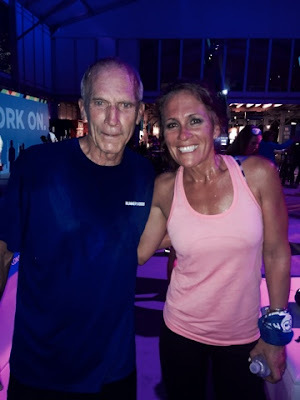 Somewhere along the way, I ended up running four miles with Bart Yasso, his girlfriend and another girl (I'm sorry but I didn't catch her name.) We talked about all things running. I could listen to him for days....so many experiences. So many marathons. One thing that stood out to me was that he told me the story of the guy who was the very first subscriber to the magazine. I love stuff like that. Running a zillion races is great but I love hearing the "real" stories. That's where the running nerd in me comes out. The run was supposed to be a three mile run but we kept talking and kept running. My gosh it was HOT!! Super fun way to kick off my weekend!! 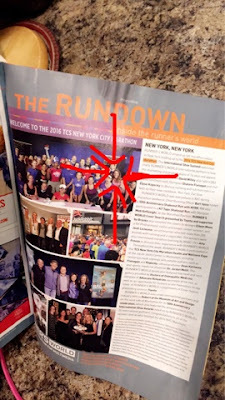 So that's the "RunDown" on the group photo in the magazine. I couldn't have been prouder. 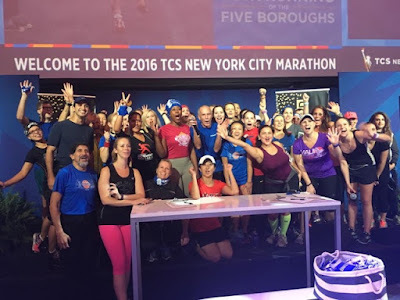 I have so many thoughts about TCS New York City Marathon.....It was really one of the best experiences of my life. I'm working on putting all of them down in a blog post but I keep typing and I keep deleting. One day I'll finish the post. As for now, I think I'm gonna rip that back page out of the magazine and frame it up on my wall with all of the other running things that no one else cherishes in my house except me. I started not to share it with anyone. It would just be a picture that represented my weekend. Just take it all in. For me. However, I dont' have it in me to do that. I am proud. I do want to share my experiences and more importantly, I want to make sure that the right people know that I'm thankful. That picture was definitely a highlight for me and gave me a new found motivation to keep using social media for what I like to use it for. Running. Races. Life Experiences. 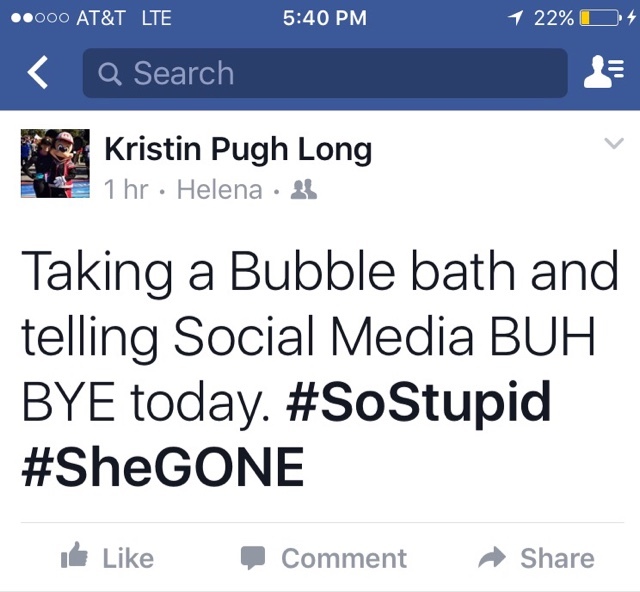 I will only compare myself to ME, I will quit looking at all of the other nonsense on Social Media ....and I will promise that I will take more Bubble Baths. 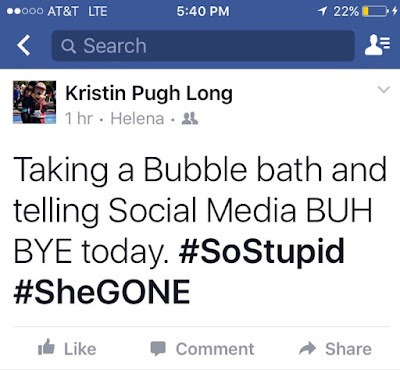 Seriously, Life is just better with Bubble Baths. Now that I've gotten home and come down off of my TCS New York City Marathon High...the reality is that I've missed it terribly and I'm super excited to run the United Airlines Half Marathon in March. Again, I'm running by myself and I just want to take it all in. I hope to meet lots of new friends and see some old ones on the course too!! I cannot thank Runner's World Magazine and New York Road Runners for lighting a must needed fire under me!! I love you guys more than you will ever know! Happy Running and see you REAL SOON in the Big Apple!!! Runner's World 50th Anniversary Shakeout run through Central Park. I'm all smiles because I'm all happy. 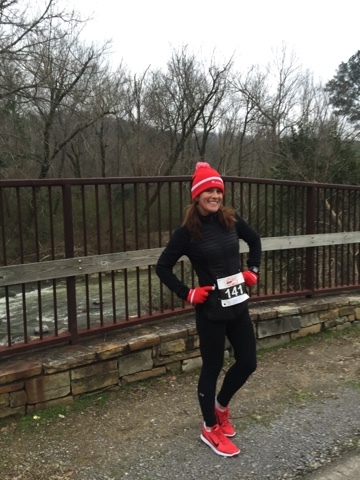 Trading in my running shoes for my RED SHOES. 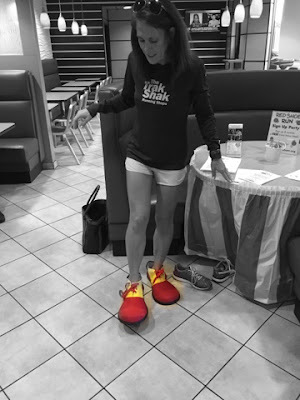 When I decided to run the Red Shoe Run in my hometown of Birmingham, Alabama last year, I had no idea that I would be forming a life long partnership with Ronald McDonald House of Alabama and the Red Shoe Run!! I knew that the race helped a good cause but boy oh boy was I in for a sweet surprise! 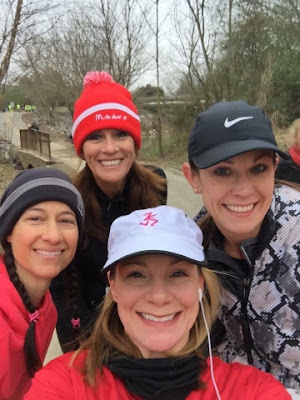 I was asked to help promote the race amongst my running friends and spread the word...I was super excited to be a part of it. Then I was asked to speak on one of our local morning television shows to help promote the race there as well! Talk about a little bit giddy! I was sooooooo giddy! 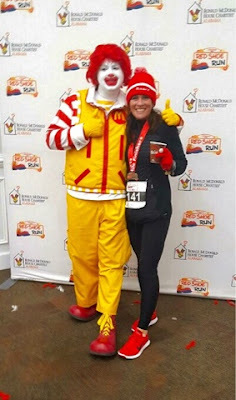 I wanted to do a good job and I wanted to help bring in as many runners to the race as I could. I wore red and white striped socks and prayed that I wouldn't stumble with my words. While the promotional part of the race is great for me, what I really enjoyed the most was learning exactly what I was running for. I went to the Ronald McDonald House. I wanted to see the facility and learn as much about the house as I could. 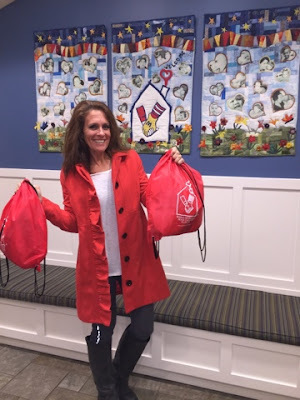 Ronald McDonald House of Alabama. 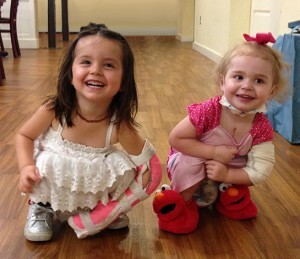 Our Ronald McDonald House cares for 41 guest families every night, providing them with a home away from home while their children receive medical treatment. In addition to providing a comfortable bedroom, we surround our families with love and support from our volunteers, staff and other guest families who share the same hopes and fears. We also provide home-cooked meals, activities, indoor and outdoor play areas, laundry facilities, computers, WiFi, and much more so that our guest families can concentrate on what is most important — family. In addition, we provide a comfortable, relaxing place to rest and regroup while only steps away from a sick child’s bedside at our Ronald McDonald Family Room at DCH Regional Medical Center in Tuscaloosa. 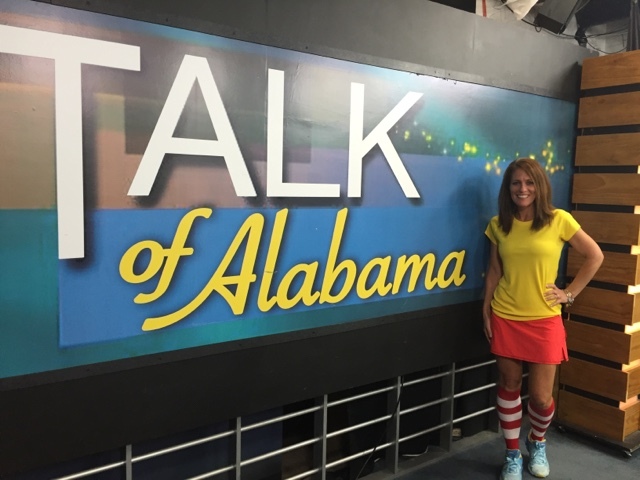 We also have a Happy Wheels Cart that delivers the comfort and care provided by the Ronald McDonald House to children and families while they’re at Children’s of Alabama. On any night when you open the door of the House, you will find 41 families and approximately 100 individual guests resting in cozy family bedrooms. We provide a stocked kitchen for guests to prepare their own meals, laundry, recreational and internet facilities, and welcoming dinners prepared by House volunteers. 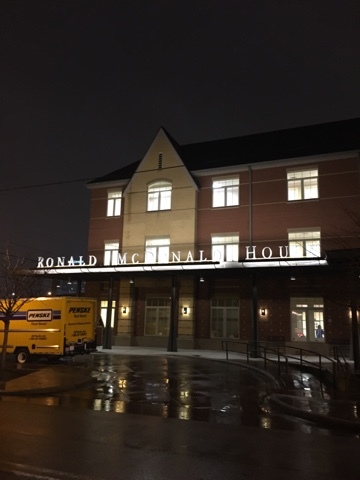 Birmingham’s Ronald McDonald House asks for a $5 to $10 per night donation for services that cost more than $95 per night to provide. No family is ever turned away for their inability to make the minimal donation. Last year, the House provided over 700 guest stays; an estimated 38,000 stays since the House opened in 1979. 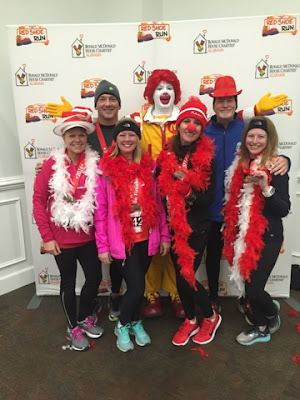 The above two paragraphs explain what the Ronald McDonald House does and how they operate. However, the next picture really summed it all up for me. As I walked in, the hallways were lined up with bicycles that had been donated for kids. 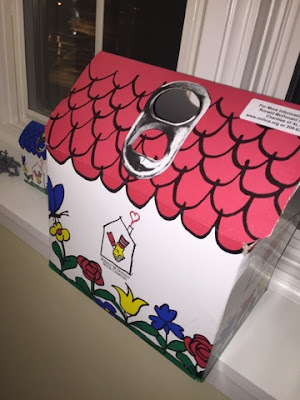 There were little pop-top collection boxes everywhere. 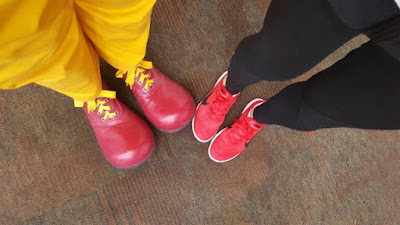 I knew then that people from all over the community pitched in to make this Ronald McDonald House work AND I knew that they money that we were raising and collecting actually went towards everything that I thought that it was. Just the fact that families can stay here while their kids are in the hospital and take some of the financial burdens off, that's huge. 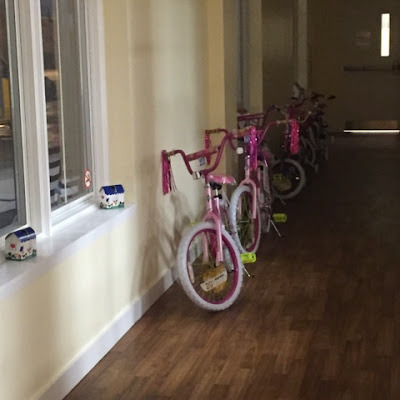 Bicycles in the hallway at Ronald McDonald House of Alabama. 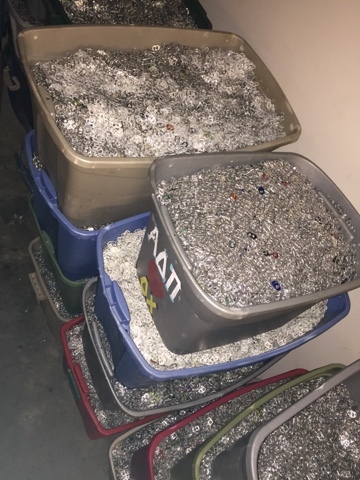 So many pop-tops collected for Ronald McDonald House. Picked up my team's race packets! Now it's time to actually run the race!! We had a starting temperature of 28 degrees! BRRRRRR!! It snowed on us while we were running! We hardly ever get snow in Alabama so this was a big deal to us. The race took place in Homewood, Al. There is a one mile fun run, a 5k and 10 Mile option. I chose to run the 10 mile option. 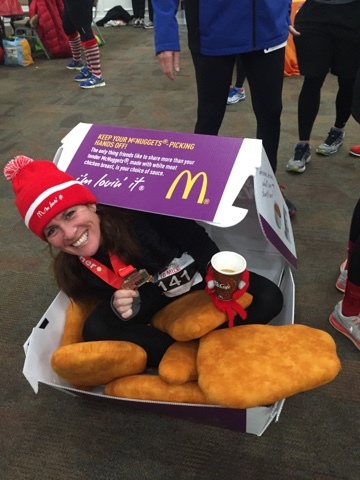 Even though we were just freezing while we ran, when we finished the race, the post-race party was indoors with lots of HOT McDonald's Coffee!! Major Score!! My friends and I had so much fun posing for pictures with Ronald McDonald, drinking hot coffee and watching the post race awards. 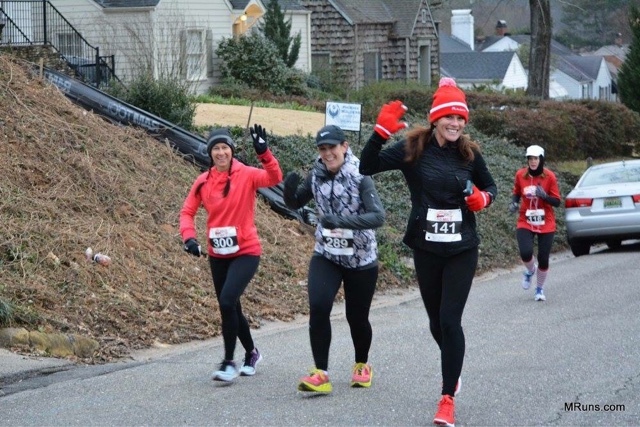 "Taking place in beautiful downtown Homewood, Red Shoe Run provides a great opportunity for team building and fundraising among groups, companies and organizations of all kinds. All money raised stays at the Ronald McDonald House in Birmingham to keep families close at a time when it’s needed most. Special awards are handed out to the top individual fundraiser, the top fundraising team, the most spirited team and the largest team. Team perks include a complimentary team sign, VIP seating and a Team Roll Call during our awards ceremony inside Rosewood Hall. This year’s event will take place on Saturday, January 21, 2017 beginning at 7:00 am. 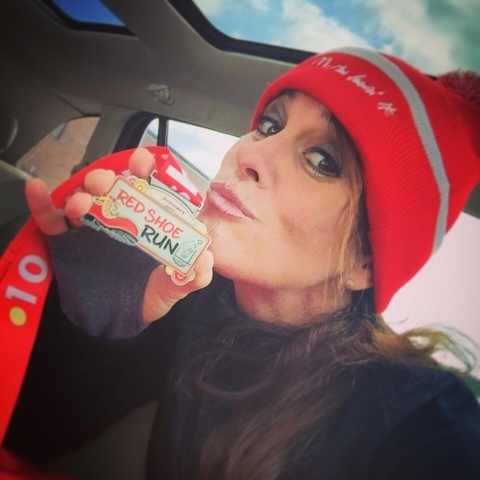 To register and begin fundraising, visit www.redshoerun-bham.org." 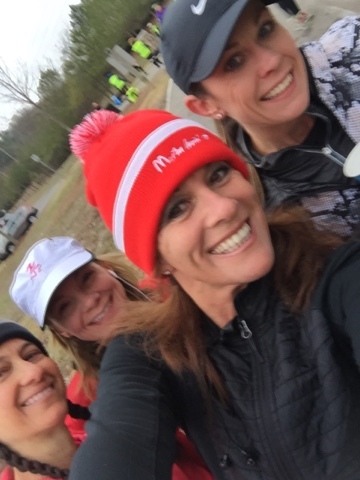 Running with my friends....always fun! 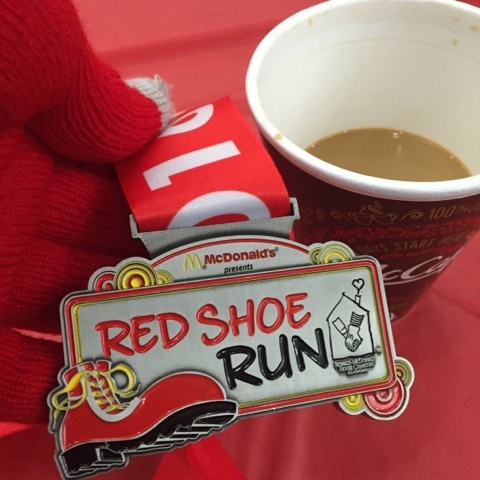 Red Shoe Run Bling....I'm Lovin' It! Overall, I would say the Red Shoe Run was a huge success for the kids and I cannot wait to run it again this Saturday! 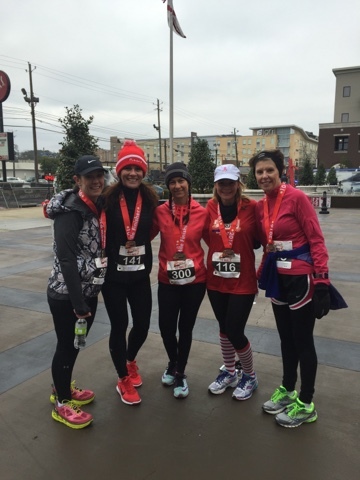 Join my team (#TeamBamagirlruns) and use code BGR17 to save yourself some bucks!